Rochdale had to be content with third place in League Two after Kevin Feely's late looping header gave 10-man Newport County a shock win. Chesterfield's 2-1 win over Fleetwood saw them take the title. Newport's 14th-place finish marked a season of consolidation after their promotion from the Conference Premier at the end of last season. "It's fantastic. We've had a brilliant season and accomplished what we set out to do and to round it off with a victory against a promoted side was a fantastic end to the season. "And it's a credit to the players because I think they have been absolutely outstanding all year." " You have to lose games to learn about yourselves. "We shouldn't really in this financial world be competing against Scunthorpe and Chesterfield for the title so it's been a great race." Match ends, Newport County 2, Rochdale 1. Second Half ends, Newport County 2, Rochdale 1. Jack O'Connell (Rochdale) wins a free kick in the attacking half. Attempt missed. Joe Bunney (Rochdale) right footed shot from outside the box is too high. Ian Henderson (Rochdale) is shown the yellow card. Darcy Blake (Newport County) wins a free kick in the defensive half. Goal! Newport County 2, Rochdale 1. Kevin Feely (Newport County) header from the centre of the box to the high centre of the goal. Assisted by Robbie Willmott following a set piece situation. Foul by Craig Lynch (Rochdale). Attempt missed. Joe Bunney (Rochdale) right footed shot from the centre of the box is too high. Corner, Rochdale. Conceded by Ian McLoughlin. Penalty saved! Matthew Lund (Rochdale) fails to capitalise on this great opportunity, right footed shot saved in the bottom right corner. Ryan Jackson (Newport County) is shown the red card for a bad foul. Penalty Rochdale. Ian Henderson draws a foul in the penalty area. Penalty conceded by Ryan Jackson (Newport County) after a foul in the penalty area. 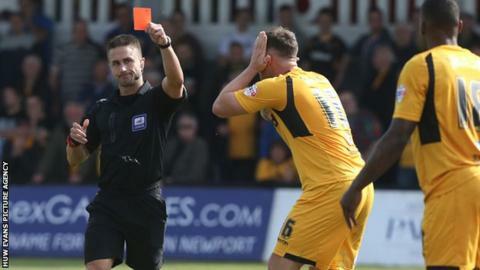 Lee Minshull (Newport County) is shown the yellow card. Substitution, Newport County. Shaun Jeffers replaces Chris Zebroski. Attempt saved. Robbie Willmott (Newport County) right footed shot from outside the box is saved in the centre of the goal. Substitution, Newport County. Lee Minshull replaces Michael Flynn. Kevin Feely (Newport County) wins a free kick in the attacking half. Substitution, Rochdale. Matt Done replaces Michael Rose. Substitution, Rochdale. Joe Bunney replaces George Donnelly. Attempt missed. Adam Chapman (Newport County) right footed shot from the right side of the box is high and wide to the right. Substitution, Newport County. Christian Jolley replaces Aaron O'Connor. Matthew Lund (Rochdale) is shown the yellow card. Rhys Bennett (Rochdale) wins a free kick on the right wing. Attempt blocked. Chris Zebroski (Newport County) right footed shot from the right side of the box is blocked. Attempt missed. Craig Lynch (Rochdale) right footed shot from outside the box misses to the left. Corner, Rochdale. Conceded by Max Porter.